Ensure (235ml bottle) has 12 grams of protein and about 25% of about a dozen other vitamins/minerals. If you take a scoop of protein powder (a 5lb container costing $60 contains some 60 scoops), you now have enough protein to fill two bottles of insure. But what about the other vitamins? Well for $15 you can buy a multivitamin that has every vitamin that ensure has + more and in higher quantity (mg). Take the protein powder scoop and mix it with water/milk to make a protein shake, and then grind that vitamin pill into the mix too. You now have two ensure bottles worth of nutrients for a tenth of the cost, and it'll likely taste just as good. And what helps is, keep your old ensure bottles and fill them up with the protein/vitamin shake, it'll actually make you feel better drinking it off the ensure bottle vs drinking it out of a glass (placebo?). Anyway, that's my tip. Ensure, like vitamin water, provides less than your over the counter vitamins and supplements, yet the packaging and marketing makes people spend hundreds more every year. P.S. You can replace the protein powder with mass gainer powder since you like the calories. Thanks for the response and the tips. Yes my main goal is getting the most calories which is why I like Ensure Plus. I may have to look into making my own mixes like you mentioned. Years ago, I did buy one of those mixes from GNC. I found that it did not mix will with liquids and was very hard to clean off the glass when it was finished. So I did not stick with it for long. Maybe I can look into it again and try another kind. Thanks. Look at the ingredients, ensure is mostly a con to sell you high fructose corn syrups close cousin maltodextrin with a ground up multivite and perhaps a dash of protein powder, then charge you a buck fifty for a tiny bottle, its a hell of a con. I think it is a little better than that, but if you say it is a con, what is a better alternative to get a convenient high calorie drink that has protein and vitamins? Well if you can afford $1.50 a bottle for questionable nutrition you can afford to just eat a better diet in general, make a fruit smoothie from time to time, most anything will do, even a good soup with some veggies pureed into it, its real food, not some maltodextrin with a multivite whacked into it. If money is no object, buy pre prepared real food, not a bottle of massively overpriced water. 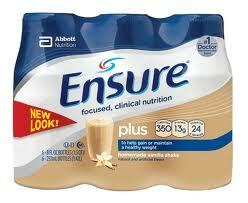 I used to work for Abbott, the manufacturer of Ensure products. Theses products are a rip off. I can't believe so many people are duped by the advertising. Look at the ingredients. The top ingredient is WATER. If you need vitamins, you would be much better off drinking 8 oz. of milk and taking a multi-vitamin pill. This would cost you about 1/10th of the bottle of Ensure. If you need calories, eat more food.